Perhaps two hours' drive from the Spanish border, located in southern France, surrounded by vineyards and next to the Mediterranean Sea, lies a beautiful city that was founded by the Romans in 118 as the first outside of modern Italy. It was known as the crossroads of southern Europe for many centuries. Colonia Narbo Martius was its first name which then became Narbono and finally Narbonne. Although the city was located about twenty-five kilometers from the sea, it was an important seaport because of the powerful Aude River that ran through it connecting it to the ocean enabling ships to access the city due to the river's deep draft. For many centuries Narbonne remained a significant harbor. Then a curious thing happened to alter the course of the city's history. The Aude River was changing. It was well known to overflow its banks on a regular basis. Slowly, the course of the Aude started to move due to increased silting which thus drastically altered navigational access. No longer could the heavily laden, enormous ships come to Gerry Niewood and Coleman Mellett Narbonne as their draft was too deep for the ever silting river bottom. By the 14 th century, the city had fallen into a slow decline due to the decrease in trade. Over time, as the Aude river fluctuated in flow rate, orientation and depth and as the Mediterranean sea level slowly rose, the 'seaport' aspect of Narbonne ceased to exist completely and it no longer served as a port. Narbonne ’s population decreased significantly and, while it remained a city, it did not have the social and political power of earlier years. Let us fast forward two hundred years to the 16 th century when there is furious work digging the canals of Europe in order to facilitate the transport of goods. Inside France the fruits of one man’s dream, Pierre Paul Riquet, are about to flower. The Canal du Midi, linking the Mediterranean to the Atlantic sea, has just been completed. The people of Narbonne , anxious to maintain their link to important trade, begin the costly work to the vestiges of the Aude River ’s access to the sea so that it will remain navigable to a limited draft vessel and also serve as a link with the Canal du Midi, which was then known as the Royal Canal . This major undertaking of works finished with the construction of the Canal de la Robine, which eventually linked with the Canal du Midi via the Canal de Jonction in 1776. Hence, despite its decline from Roman times, Narbonne managed to hold on to a vital but limited importance as a trading route, particularly in the recent centuries. The Canal du Midi was recognized as a world heritage site in 1996 by UNESCO. 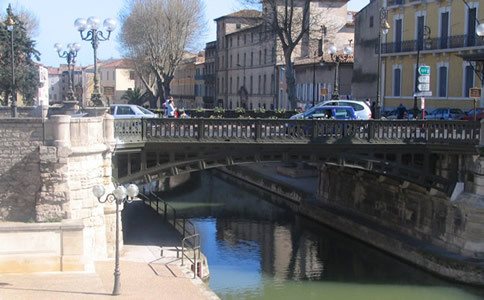 Today the Canal de la Robine is now the heart of Narbonne ’s busy and picturesque city center. 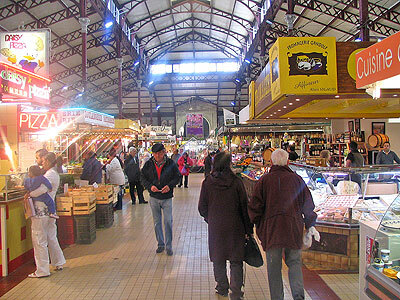 Being one of the most lively market areas in the Languedoc , people from all over the region come regularly to the huge street markets and also to Les Halles, at 101 years the oldest indoor food market in France . The centuries of trading in the area makes one imagine the ancient Romans in place of today’s street merchants and lively tradesmen and women of Les Halles. Seventy-two vendors have permanent stalls at Les Halles which includes one or two owned by the same family since the market’s inauguration on January 1, 1901. 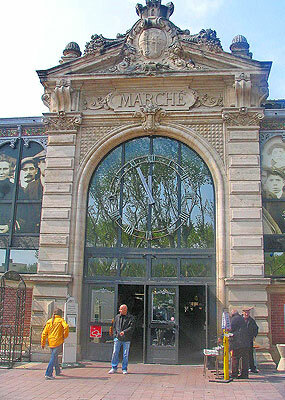 Les Halles is open every day from 6am to 1pm and located in an elegant baroque pavilion on the south side of the canal. The scene inside is lively and there are several restaurants which offer a wide range of foods which are local to the region. Oysters from the nearby etangs (salt water lakes), various seafood/shellfish, meats (including horse and duck), and beautiful colorful vegetables from nearby Spain and France are on display. Of course, regional wines, pastis and beer are all available to taste and tastings start early in the morning and continue to closing. A good time to go to Les Halles is during lunchtime while shopping is winding up and the ‘aperos’ (pre-meal drinks) are being passed around. There are no strangers here. You are part of the scene as soon as you sit down and order your meal. You are immediately pulled into the market’s conviviality as your restaurant proprietaire fills you in as to exactly where the food on your plate comes from. Meaning which stall. During our lunch, we discovered that our oysters (6 with a glass of white wine for six euros) came from the fishmonger a few rows down, our pasta was homemade by the mother of the friendly marchand across from us and our wine came from our host’s hometown in the nearby region known as La Clape. The customers are boisterous and do their share of banter and trading jokes. Lunch at Les Halles is anything but dull. 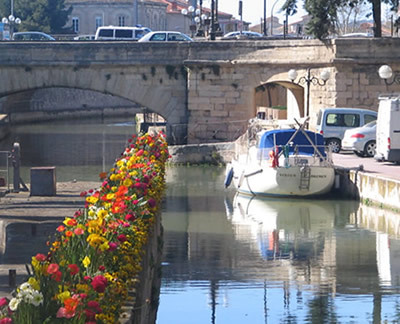 Stepping outside from Les Halles into the bright sunny day, you are on the stylish banks of the Canal de la Robine, the heart of Narbonne ’s city center. Large barges filled with goods have been replaced by pleasure cruisers both privately owned and commercially for hire. This is a perfect time to step down from the balustrades and fountains and take a stroll along the canal to admire the boats. You can take quite a long walk, for miles in either direction. Several dozen privately owned canal boats are wintering over, many with their owners living aboard. We’re appreciative, having lived in our own canal boat on the Canal du Midi we remember the romance of onboard life and the delight of living afloat. But, never mind, we are landlubbers now and anticipating our new life in a 200 year old renovated apartment, in the historic city area known as ‘de Bourg’. We are content with a view of the canal and ‘centreville’. In a few weeks all of our stuff in storage will arrive so that we can feather our new nest. In the meantime we are living in a four hundred year old Bastide, also in the center of town in the section known as ‘le Cite’. Narbonne is divided into two sections, each on the opposite side of the canal, ‘le Cite’ on the north side and ‘de Bourg’ on the south. ‘Le Cite’ is older, visibly so, with winding tiny streets and thick ancient buildings surrounding the crown jewel of Narbonne , the Cathedral. The streets are so tiny that many of the corners have been scalloped so as to accommodate vehicles that wish to turn without scraping their bumpers. Alas, many cars seem to have accepted their battered fate attested by multiple scrapes and broken side mirrors. Drivers apparently become impatient with squeaking by and just make do with body contact. It’s a daily part of living in this lively place. Luckily there is ample underground parking if one wishes. Bastides make up much of le Cite and many survive today, protected by new historical district laws. The Bastide we are in is particularly well preserved with a very large interior courtyard. 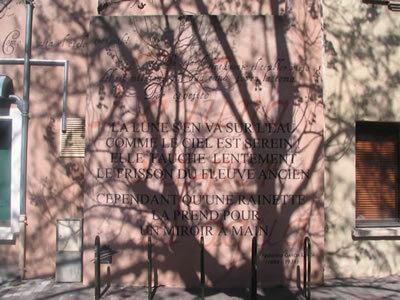 It has a lovely brass plaque at the large blue exterior doors which is engraved: La Brigade. Life at La Brigade is always lively. Our neighbor facing us across the courtyard owns the largest part. His apartment is eclectically elegant with a large stuffed tiger gracing his enviably grand foyer. He is a quirky type and gets around town on a Segway. We are staying in a grand apartment with 15 foot high ceiling covered in ‘poutres’ or exposed beams. There is a huge fireplace and two enormous windows looking out to the courtyard. The stones there have been laid out with a replica of the city’s shield. On the other side of our apartment several windows open out onto one of le Cite’s ancient streets. It is always occupied with local gossips, hanging out and creating spontaneous drama. The echoes of their voices and laughter have a theatrical air bouncing off of the thick building walls. Everyone seems to have been here forever. However, it is not just the Narbonnais that enjoy their fair city. The place has a quiet but important trade in tourism due to the magnificent Cathedral, some splendid Michelin star rated restaurants, the nearby beaches and 300 days of sunshine per year. Not to mention the wonderful Cathars region and the hundreds of wineries to visit nearby. It is the beginning of spring, the flowers are everywhere, festooning the canal bridges and the fountains. 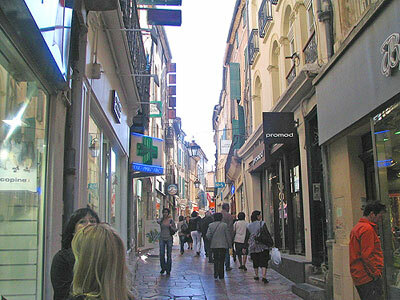 Tourists have already begun to flock into Narbonne . Restaurants that have been closed all winter are open for business. A small white train has magically appeared on the banks of the canal, waiting to fill its seats with sightseers. Narbonne is ready for its close up and we can’t wait to see more. by land or canal boat, contact www.francehelp.info or email francehelp@live.com. [Photo credits: Marlane O'Neill 2009. All rights reserved.